Is Submitting Your Articles to Article Directories a Waste of Time? Q: I’d like your opinion on something. An internet business friend claims that submitting articles to article directories is a waste of time. She says to put all the articles on my website, and the search engines will find me because of the content and strategically used keywords, etc. She says I should just have tons of content on my site. What do you think? A: Well, I’ve got two answers to your question, and I’m really glad you asked it. 1. Your “internet business friend” is not only wrong, she is very wrong about submitting your articles to the articles directories. There is so much misinformation on the internet, and it really bugs me when I hear about stuff like this. Thing of it this way – in what way could it possibly be a waste of time to spread samples of your expertise all over the internet that are working for you 24/7 all over the world? This is exactly what happens when you submit your articles to the article directories. 2. Where your “internet business friend” is correct is on the benefits of having your articles on your own web site. This is a good strategy to use and just makes sense. Now here is my question to you: Why not do both? Why not have your articles on your own web site or blog and submit them to the article directories and have them spread all over the internet? You can also use your articles on social networking sites and turn them into audios and videos. So in the final analysis you want to do both and more with your articles. Everyone has the notion that you will find favor with the search engines when you have original keyword rich content on your websites. It’s true, but a very, very slow process. Submitting articles is the quickest way to get your name out there and grow your list. I started a new website and posted seven articles to ezine articles. Within a week I had over 100 views and three of them published. You just can’t get that kind of exposure with the search engines. Publishing articles allows you to take control of your internet business rather than waiting around for the search engines to find you. For me it is about consciously choosing if this is part of your marketing strategy and then doing it consistently. I chose to adopt article writing as one of my marketing strategies about 15 months ago. My articles have had close to 50,000 views on http://www.ezinearticles.com and as a direct result of one article, I was invited to be a guest on an internet radio show along with 4 other guests, including two former candidates on The Apprentice in the US. Being UK based this would have never happened without articles banks. Misinformation bugs me too. Even if you drive traffic from your articles to your main blog domain, you can put the article on your blog on its own page! 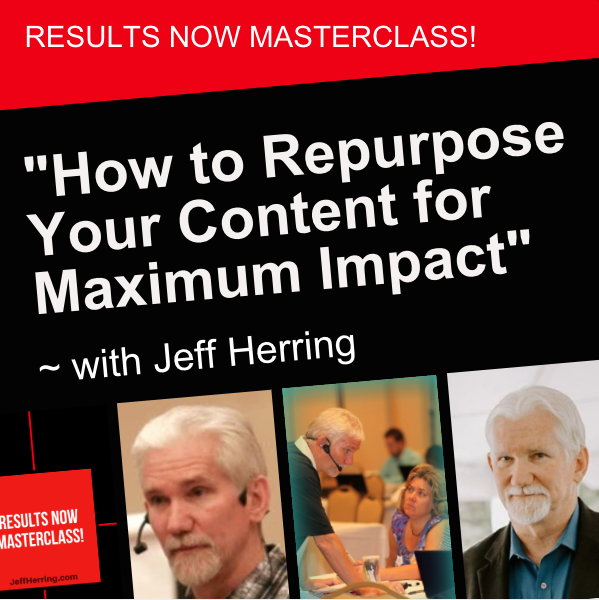 A better way to do it is as Jeff teaches – break your article up into several blog posts. But also put your article on it’s own page or create a ‘directory’ like page with your article title and a link to your article on one of the directories. There are so many ways to repurpose AND reuse your content. Just get creative! I am wondering – to build on that – how this relates to duplicate content? I know there are a lot of conflicting thoughts on duplicate content as well. I always understood that having the same article out there on multiple artice dirctories is ok, but if you have that SAME article on your blog or website, then it IS considered duplicate content as defined by Google’s duplicate content terms. Jeff – I agree with you in every way. I’m a VA and I write and submit articles for clients. I have people come to me and ask how they can become known with their business. I tell them to write articles and submit them. They act like I’m nuts. 🙂 Now I can use your blog post as back up to what I’m saying. Thank you so much for posting this wonderful Q&A. I’ve been using that tactic of making little videos of my articles and been getting page ONE rankings for my keywords. So, you are correct sir … this stuff works! Article Directories are huge for article traffic and ranking. I even did my own experiment a few times by submitting articles to directories, and just posting on my website. When I submitted to the directories my list grew. When i just posted to my website, there was little action on the list. Coincidence? Maybe, but I doubt it. I can personally attest to the big difference submitting articles to at least a top directory like ezinearticles makes. I used to submit articles a long time ago and then stopped when I started blogging more. 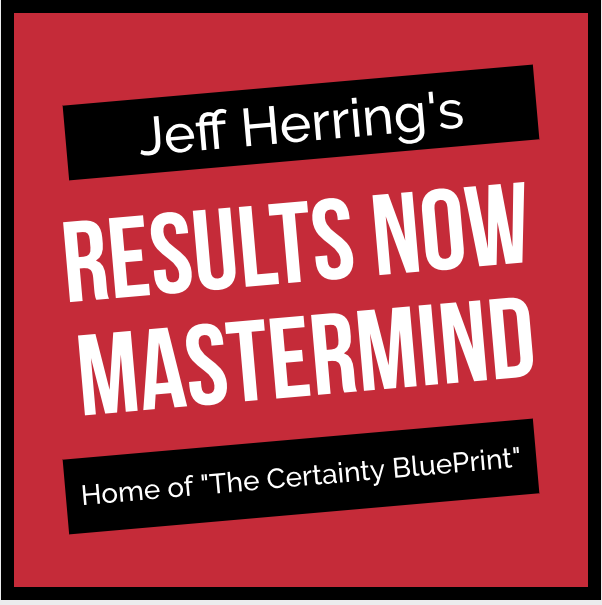 While I got traffic to my blogs through other marketing techniques, after listening to one of your teleseminars, you were so passionate about this being the way to go, i decided to try again. I’ve only submitted 7 articles on ezinearticles in the kast few days and I am clearly seeing an increase in traffic to the linked blog or site in the pieces (especially one new site in particular makemoneyinforeclosures.com that has many opt-ins, so I knew the difference). I can imagine if I built up hundreds just how that would take off. So once again I am a believer–I think the key is submitting to outside sites on a very select basis to those who have the traffic and page rank to do you the most good, not indiscriminately to anything out there–that’s how I got burnt out submitting last time. Now it’s quality vs quantity, at least for me. Looking forward to your course on the 21st! Thank you for your response to a very interesting question. I am working on articles and have been telling friends about your advice. Maybe once they see my articles, they will do the same. I better speed up to be a good role model. You already are mine Jeff. My experience has been that article writing and submission are the most effective tool for me. It beats social marketing and anything else I have done to market online, and my articles continue to send traffic to my site whether I’m writing or not. I’ve learned to somewhat automate my article submissions, and so it doesn’t take me long to do my distribution. I put my articles on my site, and I submit them to every article directory I can. I don’t care about duplicate content because that’s the article directory’s problem. It’s about exposure, and you have to be everywhere you can be to get as much exposure as possible. The senior editor from Microsoft Windows Live interviewed me a few months ago for an article he was writing. I asked him why he chose me, and he said it was because I was everywhere, and I had published quite a few articles on the topic. Thanks for helping me get my head clear on that one. Article directories are great, but you should think outside of the article directory box. Depending upon your niche, you should also include sites like HubPages, Squidoo, Weebly, WordPress.com, & Zimbio, as article platforms. Each of these are authority sites and receive a lot of love from Google … meaning they rank well in Google search engine results. Backlinks to your articles, blogs and websites from these pages can do wonders for you traffic wise. You are so right about all the incorrect information that’s out there! I am very thankful to have found your site through Alex’s Mandossian’s’. I have found your information to be stellar! I also believe that ‘birds of a feather flock together’. Alex is awesome too and his referral to you was great advice! I just listened to your teleconference from 7/9. I learn something new every time I listen to you! I only had 5 articles on http://www.ezinearticles.com to date but I was doing something wrong…as per you teleconference, I didn’t have proper keywords in the first for words. I went in and modified those articles so we’ll see. I also have completed 26 articles in the last three days to get passed that 25 mark you had set. My fingers hurt but I can’t wait to see them published and watch for the results! My field is Network Marketing training. I am so happy to find out you have an affiliate program! Thanks so much for all the great advice! I look forward to being a student in the near future! 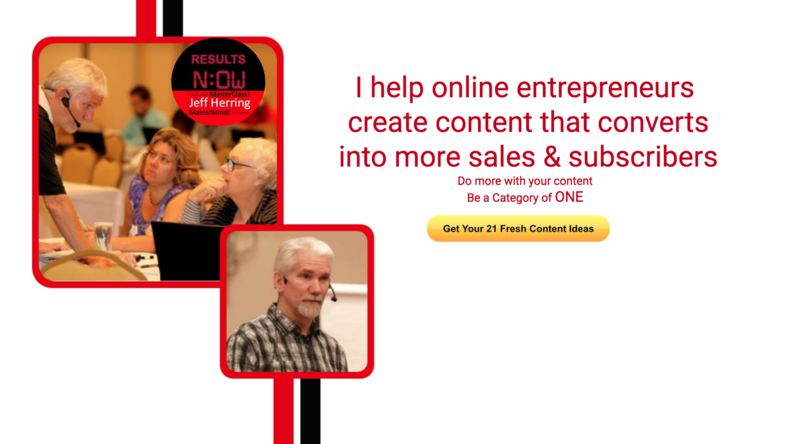 I have also learned a lot from you Jeff and I plan to use the article directories more. I have written many articles for publications in my area (photography and inkjet printing), and those tend to rank high on searches for related keywords. I’ve also found that participating in forums on websites that are in a person’s niche can be very helpful, and they allow for step-by-step or numbered, article-like answers to people’s questions. Answering people’s questions directly is the key I think, and people are often very grateful. Since I’ve added my articles to my website after submitting them to the directories I’ve noticed a huge increase in traffic. The system I’ve adopted over the last few months is to first post the topic on my blog, rewrite it into an article and to submit it (often only to one directory because it is so time-consuming), turn it into a PDF and put it on my site. But articles are imperative! And what better way to get the message out there than to submit them to as many places as possible… even your own.